I recently rescued a nine month old pup. Can anyone tell me what breed my dog is? I was told she was a Labrador Retriever when I got her, but some think she's a Shepherd mix or has American Dingo/Carolina Dog in her. It's not all that important as she's part of the family. Please help. 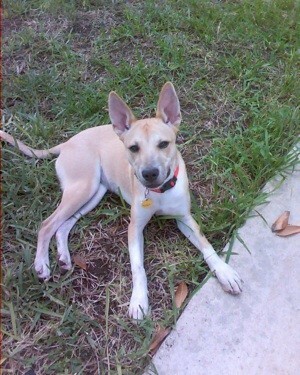 If it doesn't bark, I say african basenji. They tend to yodle, but not bark. They were used for hunting in africa, partially because they were so quiet, agile, and small. Possibly mixed with a shepherd? I was going to say Dixie or Carolina dog! They are the same dog but go by different names. My Dad has one, ever since I met her, I've wanted one, they are such great dogs! 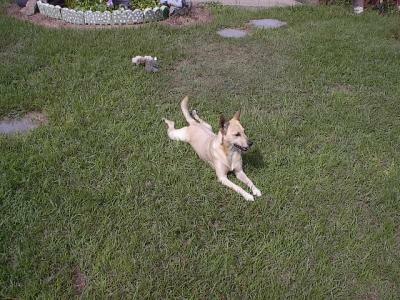 But she does look like she might have some Basenji too, NO Lab looks at all! I have a dog that looks very much like yours. When I lived in Virginia (I'm in NC now) she came down my driveway when she was about four months old and never left. She's the light of my life and had a ton of personality. Her name is Maggie May and I call her my Chinese Dingo because she squints her eyes at me. If she howls, Basenji! They don't bark, but howl. She is most definitely not a lab. She is not! She's not even crossed with one! American Dingo probably. Have you ever seen the show Gene Simmons Family Jewels? They have an American Dingo who looks just like that!